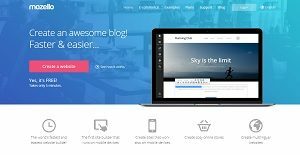 Mozello is a webpage builder that boasts of tools to help create a website, blog, or online store much faster and easier compared to other similar software. Created by European software firm Mozello SIA, the technology offers publishing, e-commerce, and hosting functionalities that can be easily understood even by users with limited knowledge on web development. Mozello’s simple set-up and straightforward solutions allow users to get up to speed with building their first blog or online store. Its infrastructure presents affordable cloud-hosting packages for newbie site-builders. Pages are guaranteed to stay up and running even if a problem occurs in one location due to simultaneous hosting on multiple servers in different data centers. Mozello’s primary features are its site builder and content management platform that were designed to make page creation as easy and quick as possible. The service is also said to be the first of its kind to be developed to operate on mobile devices, thus allowing users to edit their sites anywhere, as long as their device is connected to the internet. Page setup requires just a few simple steps. Upon signing up for a Mozello account, a user can add their webpage name. They then need to choose a template from a variety of designs for blogs, e-commerce sites, photo galleries, catalogs, portfolios, and the like. Text can be easily added and edited, with the option to change colors and upload graphics. There is also an option to develop a web page from scratch if none of the integrated templates appeal to the user. The dashboard of Mozello makes it easy for newbie site builders to get a page up and running. One can add blog posts straight from their account and incorporate photos, video clips, tables, symbols, buttons, or custom codes. Mozello has tools to make blog management flexible depending on how much interaction the page owner wants. Commenting and social media sharing is available, but can also be disabled. Mozello has e-commerce functionalities that allow users to upload items for sale. Entries are clickable and redirects to detailed descriptions and an add-to-cart button. Users can maximize revenues since Mozello does not take any commission from online sales. The program carries payment processing tools to facilitate online transactions via providers such as PayPal (for basic subscribers) and Stripe, Braintree, PaySera, and more (for higher-level subscribers). Other Mozello features include Post Scheduling, which allow page owners to save drafts and automatically publish them at an indicated date and time. Google Analytics support provides statistics of website traffic and visitor profiles, thus allowing page owners to develop better strategies. Online store owners and their buyers are also assured that transactions are secure with Mozello’s HTTPS connection that is automatically used on checkout and payment pages. If you are interested in Mozello it may also be a good idea to check out other subcategories of Best Blog Software collected in our database of B2B software reviews. Since each company has unique business needs, it is sensible for them to desist from seeking a one-size-fits-all perfect software application. Needless to say, it would be pointless to try to find such an app even among market-leading software solutions. The intelligent thing to do would be to list the various essential factors that need consideration such as key features, budget, skill levels of staff members, company size etc. Then, you should do your homework thoroughly. Read some Mozello reviews and look into each of the other systems in your shortlist in detail. Such exhaustive research can ensure you reject ill-fitting systems and select the system that offers all the aspects you require for business success. How Much Does Mozello Cost? We realize that when you make a decision to buy Blog Software it’s important not only to see how experts evaluate it in their reviews, but also to find out if the real people and companies that buy it are actually satisfied with the product. That’s why we’ve created our behavior-based Customer Satisfaction Algorithm™ that gathers customer reviews, comments and Mozello reviews across a wide range of social media sites. The data is then presented in an easy to digest form showing how many people had positive and negative experience with Mozello. With that information at hand you should be equipped to make an informed buying decision that you won’t regret. What are Mozello pricing details? What integrations are available for Mozello? If you need more information about Mozello or you simply have a question let us know what you need and we’ll forward your request directly to the vendor.